The FCC isn't the only agency playing with devices we don't even know exist: its Chinese equivalent has recently had some hands-on time with an unknown Huawei smartphone, codenamed the P6-U06. 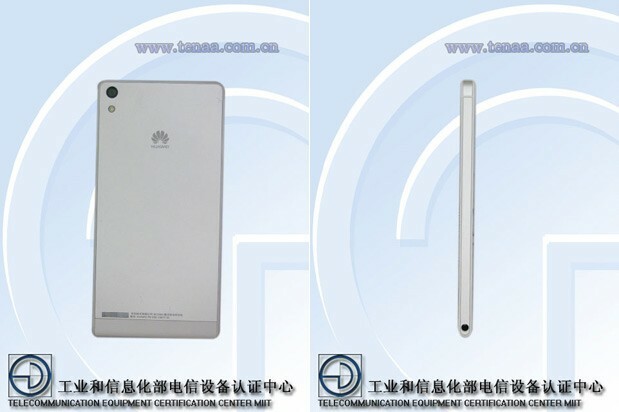 Luckily, there are a few pics and specs to accompany the filing, which tell us it weighs 120g (4.2 ounces) and measures 132.6 x 65.5 x 6.18mm (5.2 x 2.6 x 0.2 inches), meaning it could be the super-slim P series handset a Huawei exec hinted at in January. It didn't materialize at MWC, but the same executive promised more was to come in 2013, possibly starting with this P6-U06. Those dimensions house a 4.7-inch TFT screen at 720p resolution, quad-core 1.5GHz processor, 2GB RAM, an 8-megapixel camera on the back and an unusually large 5-megapixel sensor in the shooter up front. Unsurprisingly, Android 4.1.2 Jelly Bean is listed as the OS, while GSM / WCDMA radios suggest Asia as the target market (not to mention the Chinese certification). That's all we've got on the P6-U06 for now, but in lieu of official press shots, the handset strikes a couple more candid poses after the break.